This plant grows from 8 to 16 inches tall. The hairy scape has a solitary pink inflated flower. It is a perennial with two opposite, elliptic basal leaves from 4 to 8 inches long that are deep green, thinly hairy, pale beneath, and strongly ribbed. 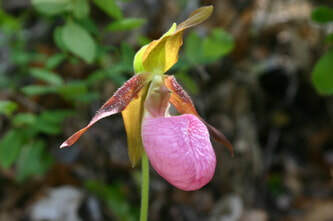 The flower lip forms the drooping pouch known as the Lady's Slipper. This plant is poisonous if ingested. 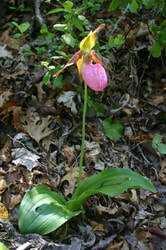 The Pink Lady's Slipper flowers from April to May. it is occasional, and is found in dry to moist open acidic woods. It is often found in hummus mats covering rock outcrops. This flower grows from 5 to 12 inches tall. There is a short stalk that rises between 2 large, glossy, basal, obovate, green leaves. The stalk is is topped by 2 to 15 white and pink to deep lavender flowers. Three sepals and 2 upper petals are fused together to form a purple-pink hood over a white, spurred lip petal. Within the long spur of this orchid is a syrup very rich in sugar. 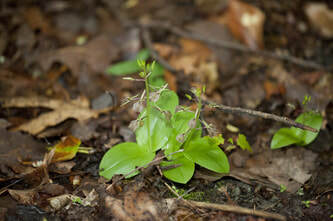 This plant is found in rich, damp, woods and swamp edges. It flowers from April to June. This plant grows up to 18 inches tall when flowering. 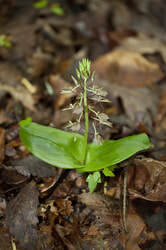 The flower stalk is between 8 and 16 inches tall and has a cylindrical cluster of many small, white, round flowers atop a leafless, wooly stalk rising from a rosette of dark blue-green, white-veined leaves from 1.2 to 2.4 inches long. The flowers are 1/4" long. These highly decorate leaves are unusual and are often collected for ornamentation, a practice to be discouraged. It can be mistaked for Goodyera repens (Dwarf Rattlesnake Plantain) when not flowering, but the Dwarf Rattlesnake Plantain has flowers less than 1/4" and they are only on one side of the flowering stalk. The common name of this plant refers to the mottled leaves, which resemble a snake's skin, a similarity that once suggested their use as a snakebite remedy. This plant is found in dry or moist, deciduous or coniferous woods and well-drained wooded slopes. It flowers from May to September. This plant grows from 3 to 10 inches tall. It has 2 opposite, spreading, basal, green leaves that are glossy, elliptic, and clasp the stem. The flowers are delicate, .6" to 1" wide with 3 pale green, narrow, spreading sepals, two of which are hidden behind the lip. There are two lateral petals that are purple and thread-like, and curved backward. 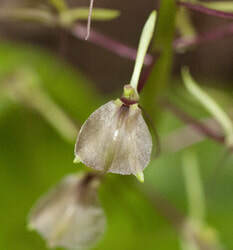 The lip petal is translucent purplish to brownish. The flowers of this plant open from the bottom to the top. It flowers in May to June. It is found in moist forest slopes and stream banks, and is considered occasional.